What do you do when Randy Couture, one of the biggest names in the UFC, says he wants to hold a charity paintball event? If you play on his team, you get bragging rights that you played paintball all weekend with "The Natural." If you play against him, you possibly run the risk of provoking a man that can choke you out in three seconds flat. But when the event benefits the Xtreme Couture G.I. Foundation - Randy's charity for wounded American service men, women, and their familiesâ€”it's not a difficult decision. For Bad Karma, the event started well before the weekend. Team members Nate Durbano and Pat Burns headed down to Mesquite several days early to meet up with Tim Andrus, owner of A Pirates Paradise Paintball. The three, with help from others, worked on the field to prep it for the big event. By Friday the field was ready for players and teams to come, meet each other, and walk it in advance of the next two days of play. Bad Karma met up with The Northern Gunmen there, who had traveled all the way from Ontario, Canada. After finding both would be on the red team, they walked the field together. That night was a meet and greet for all the players with plenty of food and entertainment. Bad Karma hit the sack around midnight with dreams of epic game play yet to come. Saturday morning came early as players slowly woke up and geared up to hit the field. Games started at 9:30 with hour-long halves and lengthy breaks for rest and hydration in the unusually hot October temperatures that reached almost 100Â°. Bad Karma and The Northern Gunmen coordinated in the first half with a furious push to the center flag. The sandy field made running slow while the salt cedar thickets provided both long shooting lanes and plenty of close quarter ambush opportunities. After securing the flag, Bad Karma dispersed through the middle of the field to hold it from the blue team's onslaught. Soon the blue team approached from the front, resulting in intense firefights that lasted almost the whole hour. The terrain lent itself to some great flanking and back door maneuvers from the blue side, but the red team fought them off without losing the flag. The second half started similar to the first, with both teams meeting quickly in the middle. Red's initial push was turned back by a blue side barrage. Nate Durbano, acting as the Bad Karma commander for the event, regrouped with Brandon Durbano, the flag runner, and formulated a plan. Brandon advanced behind cover to within 10 feet of the flag while Nate crawled through the brush to a different angle. On cue, Nate popped out away from the flag and emptied his loader on a bunker that held multiple blue players. Under cover of Nate's fire, Brandon captured the flag and fell back behind cover. Seconds later they were joined by almost 15 teammates, enabling them to push into the city. Clearing huts and bunkers, the red team advanced more than 20 yards past the city, picking off stragglers left behind and putting nearly the whole blue team in the dead box. Seeing the blues backed into their own base and realizing it wasn't going to be fun for everyone involved, Nate ordered all Bad Karma players to stop shooting and to fall back behind the flag to the city. The Northern Gunmen decided to support the move. With the blues gaining a defensive footing again, exciting and frantic firefights resumed for the remaining 30 minutes of the game. Lunch was a long break that let everyone rest up, cool down, and drink up. Randy Couture and other MMA fighters that came to support his G.I. foundation socialized with paintball players, thanked them for their support, and were more than gracious with pictures and autographs. After lunch, field boundaries were shrunk to not only keep players from running long distances in the hot sand, but to keep the action up throughout the whole field and not just in a few hotspots. The city was now out of bounds, leaving only the salt cedars and a few wayward bunkers for cover. The whole feel of the game shifted from tactical, area defense to all out brush ball. The center flag remained the only objective and switched hands many times in the close quarters. The day was called as the sun fell closer to the horizon and everyone left very sore and tired, but satisfied from the day's action. Tuff-N-Uff MMA fights were held that night, followed by much need sleep for all involved. Sunday dawned with nearly half the red team members needing to leave. Outnumbered 52 to 24, the red team decided they were up to the challenge and kept playing. The rules were tweaked for the final battle: no points and no objectives but the center flag. The team's flag that was flying when time ran out would be declared the winner. It was a grueling battle and red didn't advance much past the first bunker and tower in the city. They took fire from just about every angle, but refused to give in. With the importance of the center flag, some truly spectacular flag runs occurred. But even with the brave stand on the red side, the player difference was just too much to overcome and blue won the last phase. After the final battle, lunch was prepared and players started cleaning up for the awards presentation and their various trips home. Bad Karma was honored with not one, but two individual player awards. Pat Burns was awarded the overall MVP trophy for his dedicated play on a still mending leg fracture, while Nate Durbano took home the overall sportsmanship award, due in part to his ordered withdrawal during phase two on Saturday. "I don't remember anyone on the red side complaining or objecting to the move back," he said. 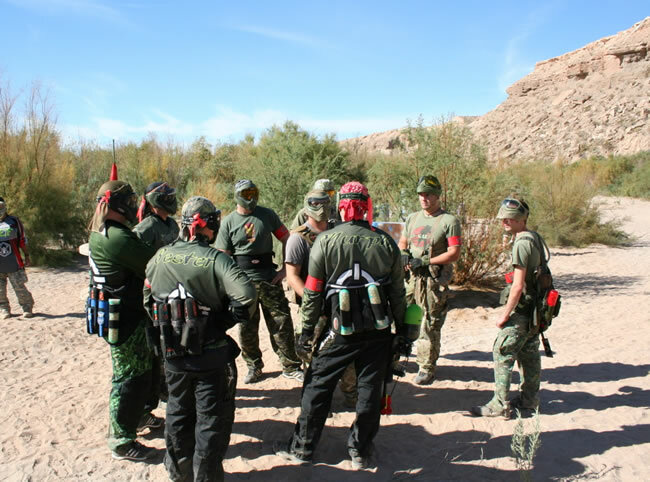 "It was one of those good moments in paintball when you see people working as a team on every aspect of what makes paintball such a fun competitive sport, and where winning by all means necessary didn't cloud our better judgment." It was an excellent event and Bad Karma was proud to be part of it and to support Mr. Couture's wonderful foundation. It was the best event we went to all year and we can't wait for the sequel next year. 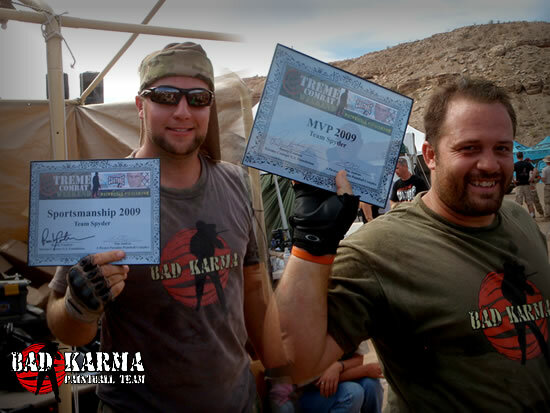 Bad Karma would like to thank the event sponsors: Spyder/Kingman, Full Clip, Dangerous Power, Planet Eclipse, Special Ops Paintball, and the UWL. It's always nice to see these companies giving back to paintball players, especially in these hard economic times. Last, but certainly not least, we want to thank Tim Andrus, the Suicide Kings paintball team, and Feel the Paint paintball team for staffing the event. Superb job.